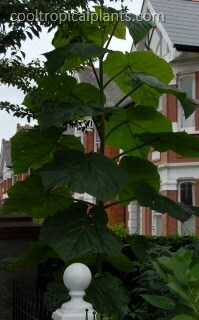 Paulownia tomentosa- the foxglove tree is probably too big for most gardens. 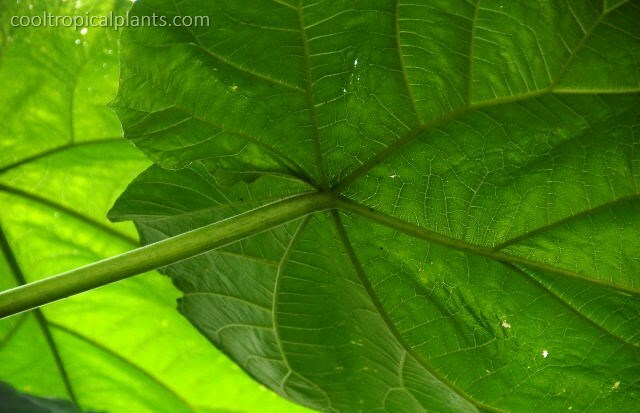 However if it is cut back to the ground each year (stooled), it produces enormous leaves that can be used to good effect in your tropical style garden. It is hardy to at least zone 9. According to a sign nailed to the trunk, this tree had been planted 25 years before the picture was taken. During the summer the tree is awash with, as the name would suggest, foxglove like flowers. 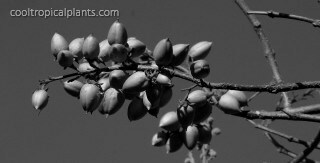 In the autumn the trees are covered in seed capsules, each containing countless tiny, papery seeds. The leaves are relatively small and less rounded compared to the stooled version. Sprinkle the seeds on top of sterile compost in February /March. Do not cover the seeds. Greenhouse or windowsill culture is sufficient for germination. Grow any resulting seedlings for a year in pots before planting out the following spring. 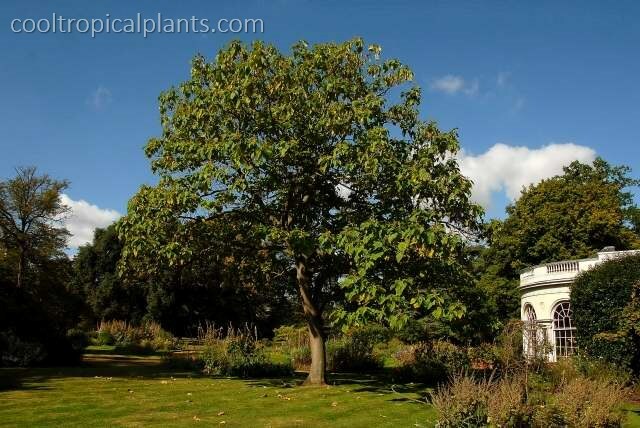 Allow the young trees one or perhaps two more seasons to establish a good root system. Cut off the stem. This can as be as close to the ground as you like. You can leave a significant section of trunk intact if you wish . This allows you to gain extra height which is useful if the area you have chosen to plant your tree is surrounded by tall vegetation. 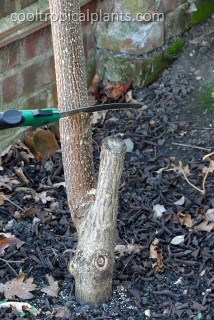 A good mulching around the base of the trunk at this stage would not go amiss. 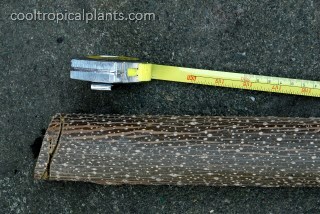 In this instance the removed portion of the stem is over 3 meters. 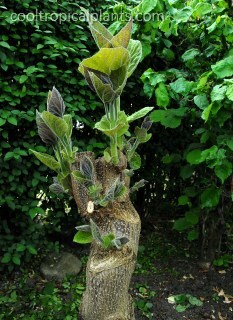 In the spring (late April/early May) the stump will begin to produce purple shoots. Select one or three shoots to leave on the stem. Any more than three and the leaves never get to be quite as impressive. 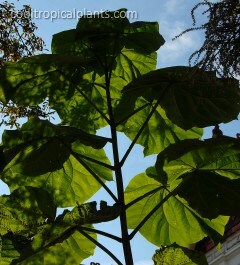 One shoot will produce the tallest stem with the biggest leaves. Two shoots never look all that good. 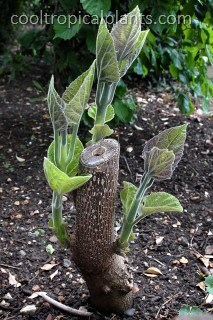 Three shoots allows you to produce an more interesting (upright forked) stem shape over the years. More than four and it ends up looking like a bush with moderately large leaves. Each year you do this, think about how you would like your stem to develop and leave the appropriate shoots on the trunk. There is usually plenty of choice. Funnily enough the section of stem that had been removed previously also begins to grow at the same time, even if it has been several months since it was removed. 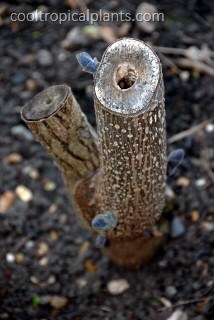 Several attempts have been made to take Paulownia tomentosa cuttings from these shoots but without success. Anecdotal evidence suggests that rooting cutting from these shoots is possible but can be a bit of a hit and miss affair. 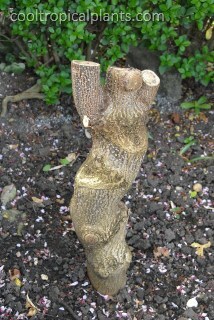 The same stump after three seasons. There is one drawback to this plant. 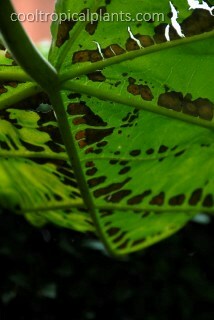 Unfortunately the leaves of Paulownia tomentosa are susceptible to a type of rust. This becomes more and more disfiguring as the season progresses. 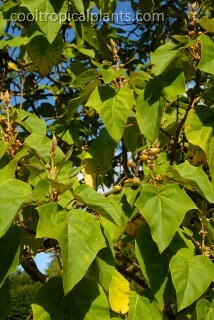 It requires that more and more of the lower leaves are removed with time. However it is certainly worth experimenting with the Foxglove tree if you enjoy plants with good nought to sixty capabilities. Plus your own garden may not be as succeptible to this problem.